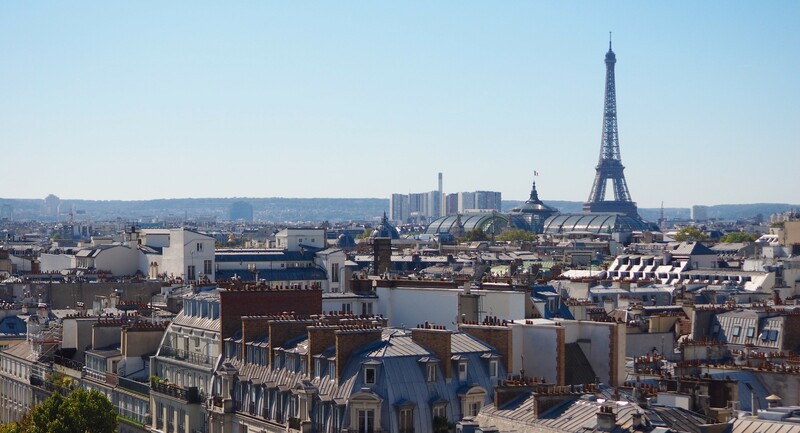 For our first anniversary, and as a sort of late honeymoon, the hubby and I decided to take a trip to Paris. Here are a few of our favorite moments, in no particular order. Enjoy! I’ve always had an affinity for cemeteries, even as a child. My mother and I used to explore the ones near our home in Vermont and I’ve spent numerous hours wandering through the many in Chicago. 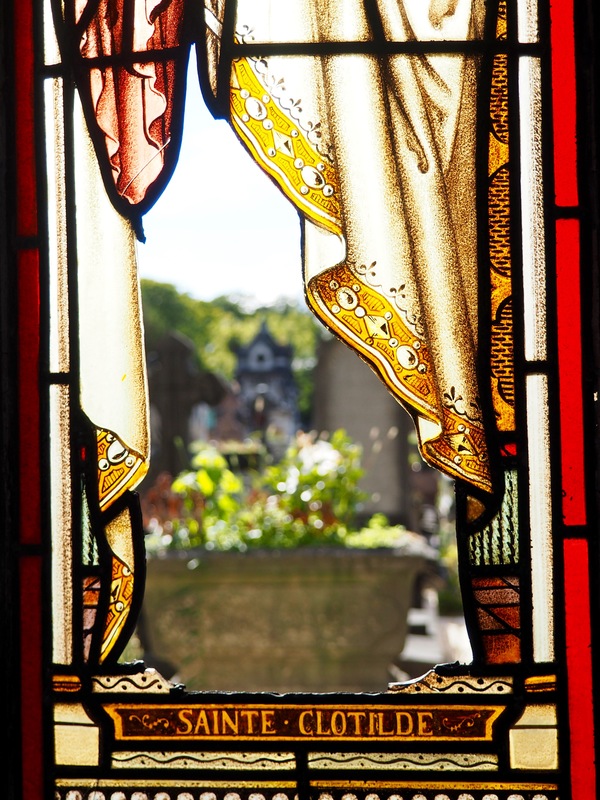 That said, Pere Lachaise was high on my list of places to visit in Paris and I can safely say that it is one of the most beautiful cemeteries I’ve ever seen. 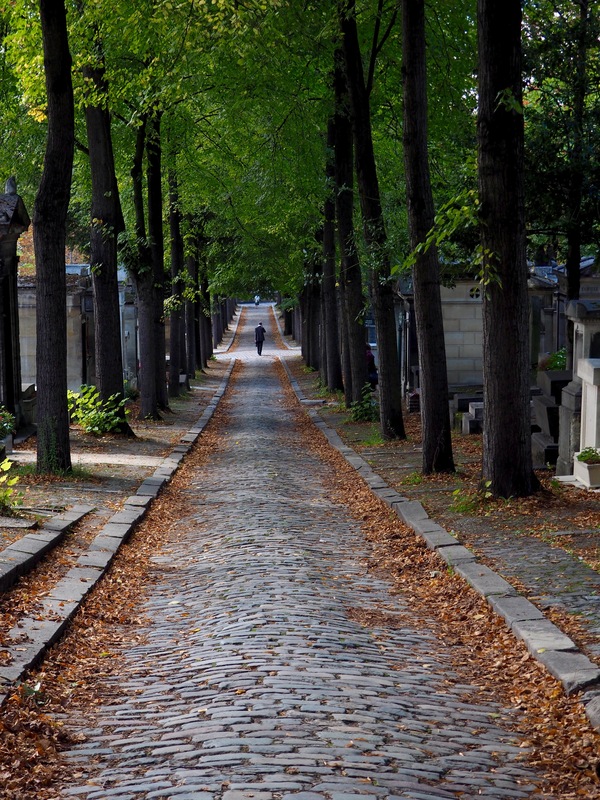 You can easily get lost for hours along the cobblestone paths and rows of ornately designed mausoleums. Thankfully, there are maps throughout to help guide you along your way, including in the hunt for some of the cemeteries more famous residents. We missed Jim Morrison’s (of The Doors) grave, however we were able to track down songbird Edith Piaf and the infamous Oscar Wilde. We came here on our first full day in Paris. 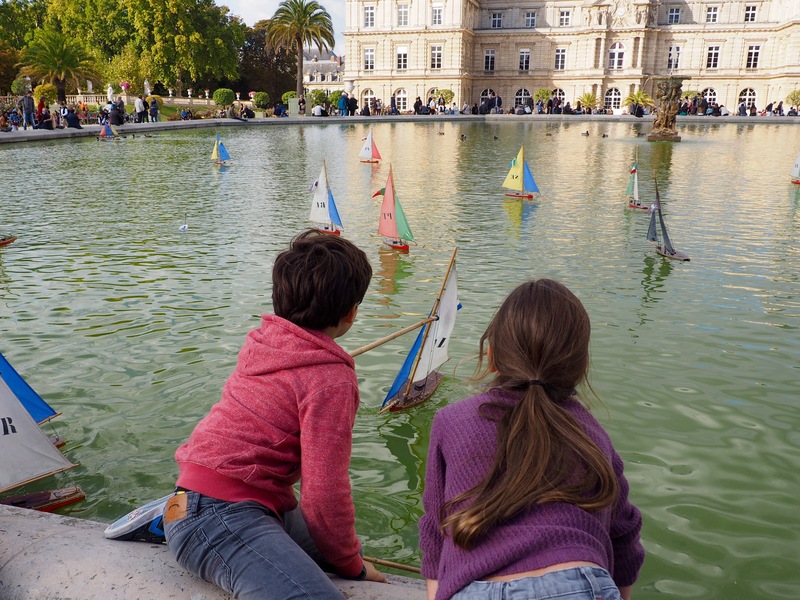 Still a bit bleary from jet lag, we weren’t quite ready to brave the Paris crowds just yet and we were looking to enjoy a slower pace for the evening. For that, St. Martin was perfect. Dozens of Parisians congregate here, in groups and alone, just to sit and enjoy the canal. We stopped in a nearby shop and got some waters and a few snacks before claiming a little spot of our own near one of the footbridges. Eric took the opportunity to do some sketching, while I snapped photos and people watched. After an hour or so, we finally headed to dinner nearby at Hotel du Nord, where I had the most delicious risotto of my life! Then, of course, we got lost trying to find our way to the train, but even that couldn’t put a damper on the evening. It was wonderful to see Eric sketching for fun, something he rarely gets to do at home. 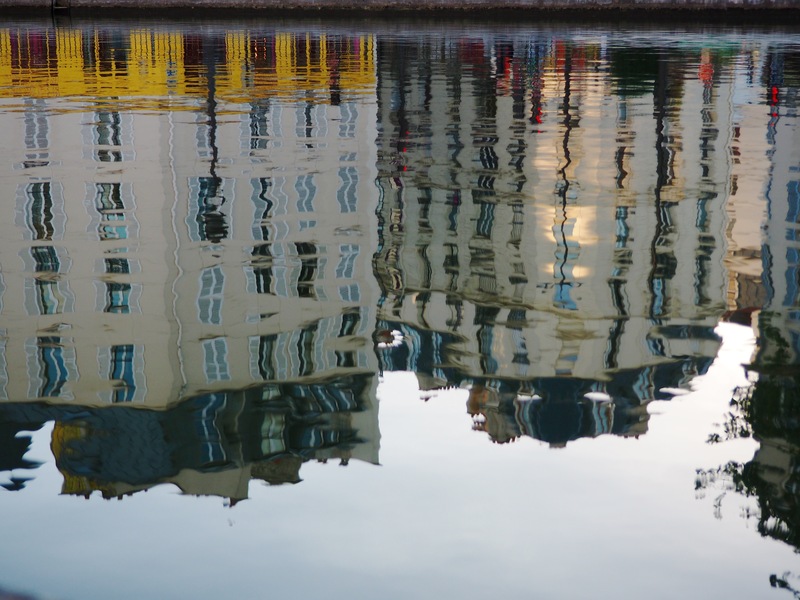 Reflection of the buildings in the placid canal. Reading at Shakespeare and Co. 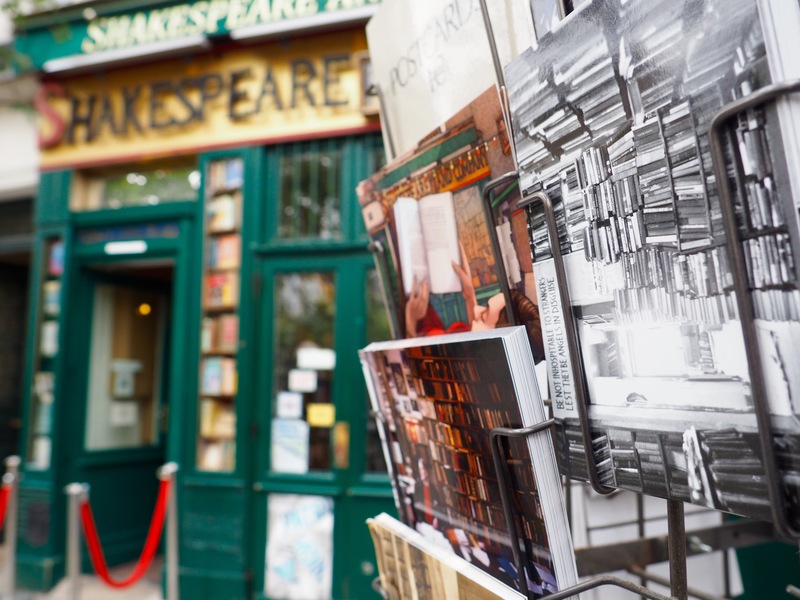 This famous little English language bookstore was a must see on my Paris list, and if you are a bookworm it is definitely not to be missed. 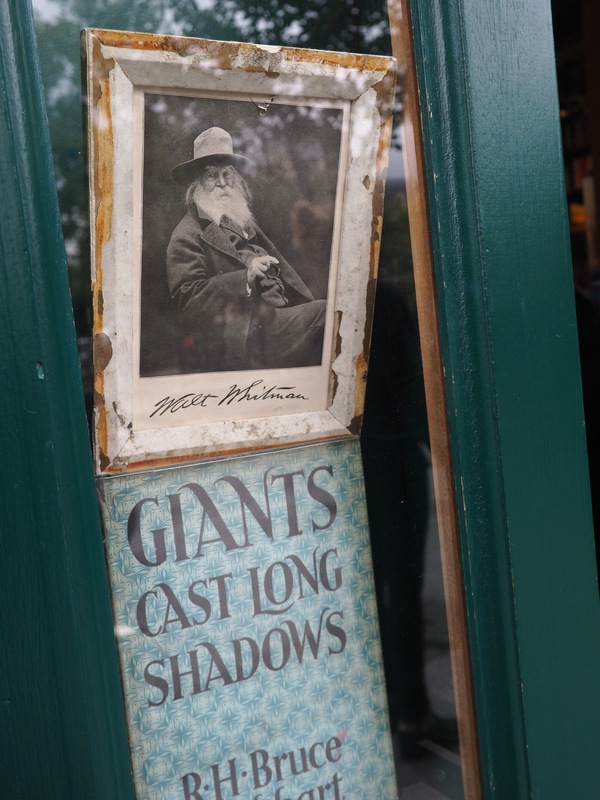 The history is tangible among the rows and rows of books, especially in the nooks and crannies of the second floor, which is plastered with photos and mementos left over the years by the shop’s many patrons. Of course I couldn’t leave without a little memento of my own, so I chose a copy of Le Petit Prince to take with me (don’t forget to ask them to stamp the inside of the book for you). 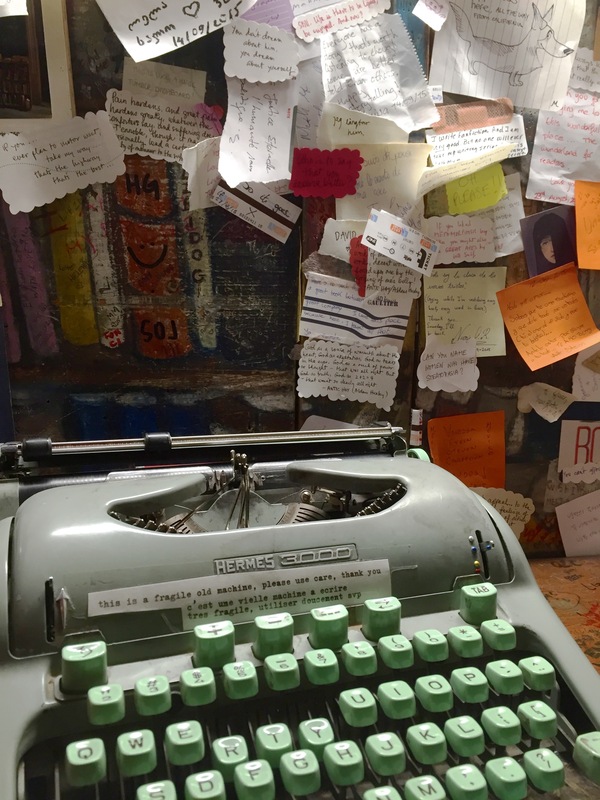 A nook on the second floor with a desk and typewriter and what must be thousands of little notes left by travelers from all over the world. Love this photo of Walt Whitman. 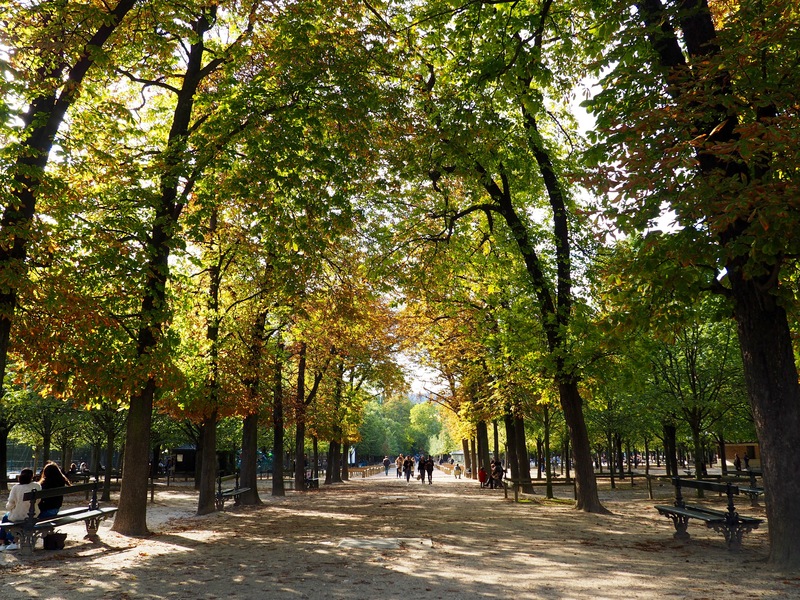 Conveniently located right around the corner from one of Pierre Hermes’ many locations, the hubby and I bought a generous box of macarons and made our way down the street to the Luxembourg gardens. We plopped down in the nearest empty chairs we could find and shamelessly devoured them in one sitting. Delicious! Now I know why the pace of life in Paris seem so much slower – it’s because everyone is in a sugar induced coma. Regardless, we took advantage of our lethargy and spent the afternoon enjoying the gardens. We pulled a few chairs together and laid down in the shade. 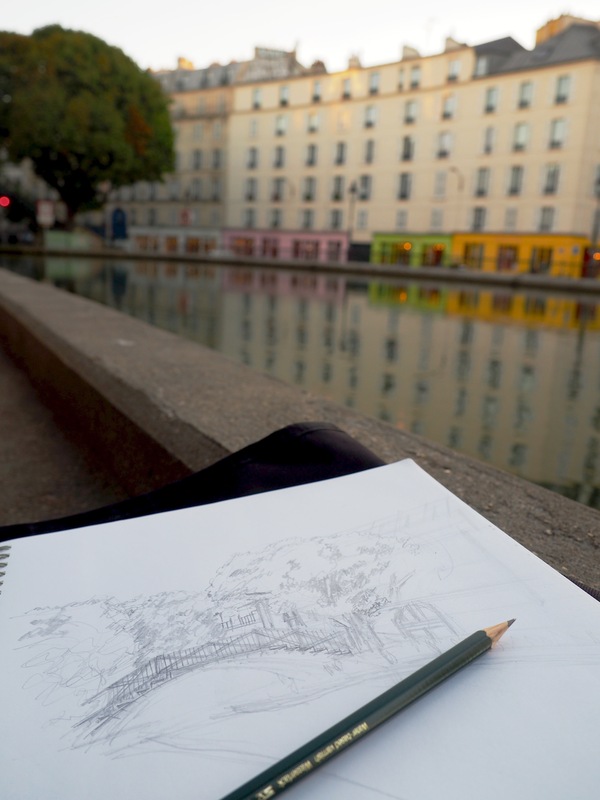 Then I walked around the fountains while Eric sat and sketched in his notebook. 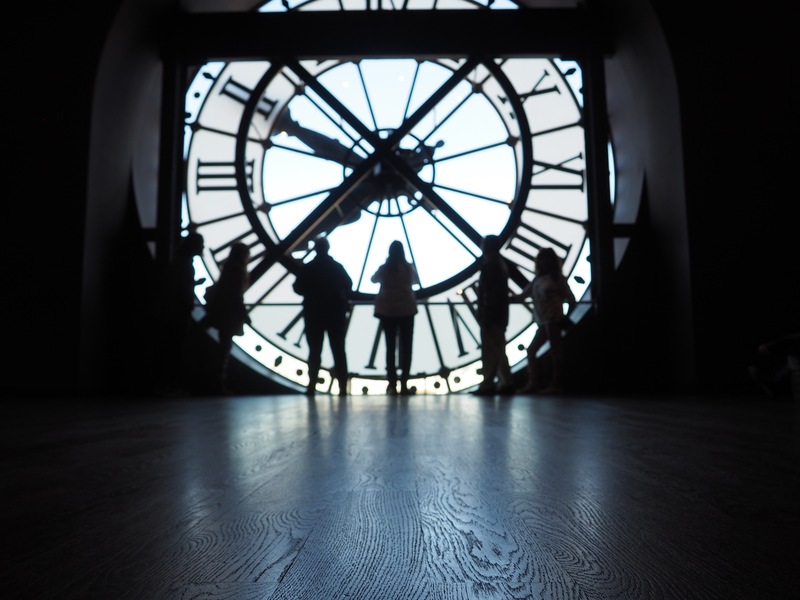 This was just a few days into our trip, but it was nice to feel like we were finally starting to match the slower pace of Paris. Navigating our way to the actual entrance of the Arc was a bit of a challenge. Crossing the lanes of traffic is not an option, so you have to actually go underneath the street and it took a few minutes for us to get our bearings. Nonetheless, once we did figure it out it was a breeze. We arrived around 6:30 pm and there was next to no line, so we went right up. And by right up, of course I mean we started the long climb to the top. You pass two galleries/museums on the way, which is a good excuse to take a breather. And once we finally made it to the top the views of the city were well worth the 284 steps we had to climb to reach them. 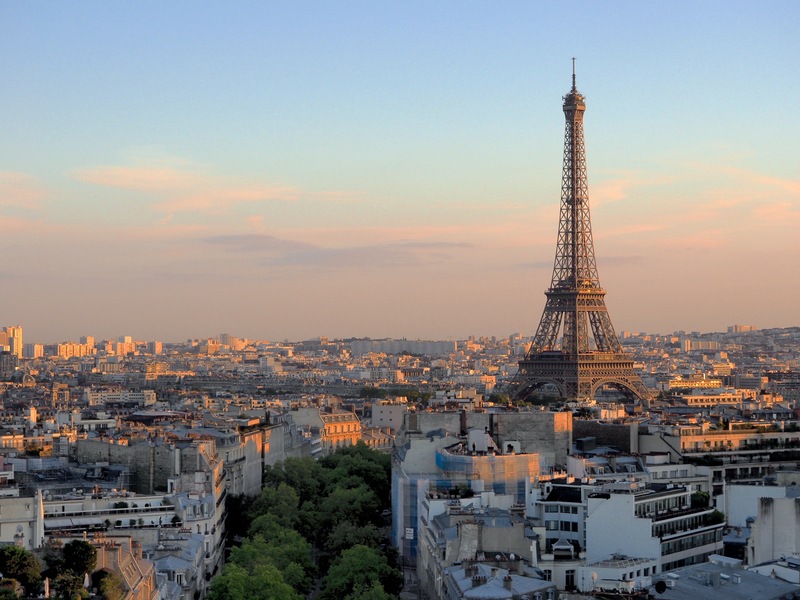 A perfect view of the Eiffel Tower. 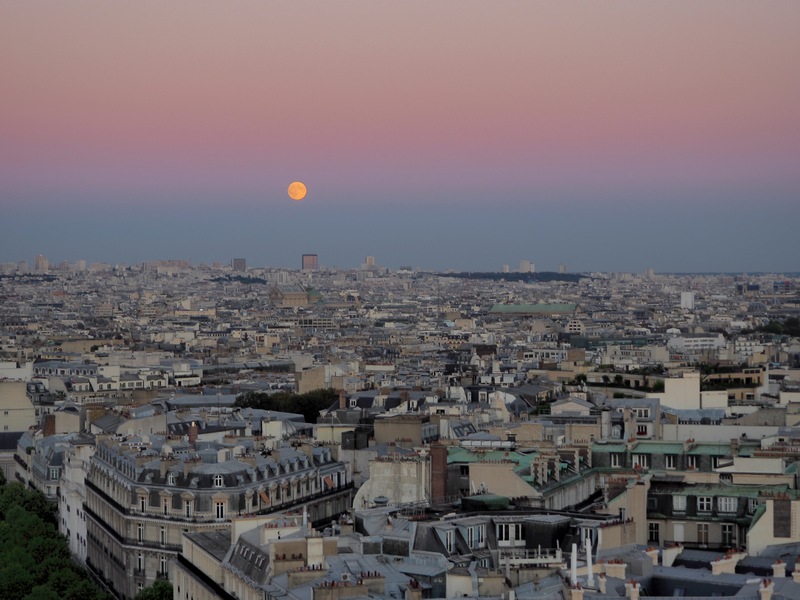 A full moon over paris. We arrived early in the day, as we’d been warned that the crowds flock in droves to watch the sunset. 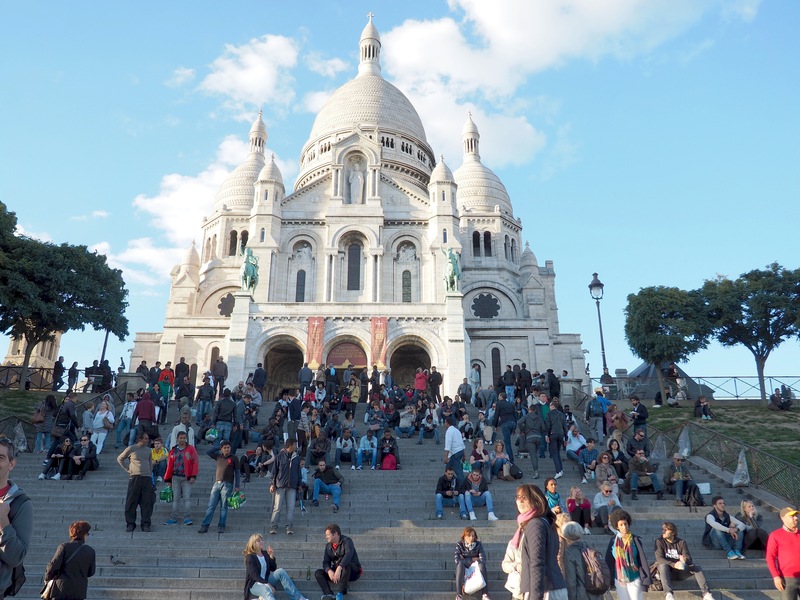 We took the metro to Anvers and made our way up toward the steps of the Sacre Couer, a basilica perched at the highest point of Paris. 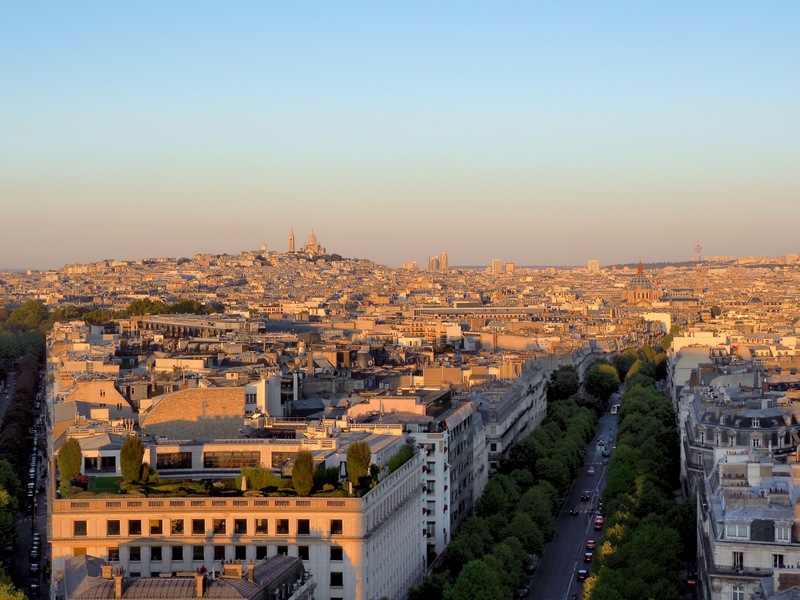 We’d spent all week admiring the beautiful, white marble structure from afar-from atop the Arc de Triomphe and the roof of the Printemps building – but up close, it was even more beautiful. The energy on the steps was indescribable and reminded me of sitting on the Spanish Steps in Rome. There was a harpist playing old folk songs, and sitting there, in the company of hundreds of happy strangers, listening to his rendition of El Condor Pasa, was maybe one of the most serene moments of our trip. 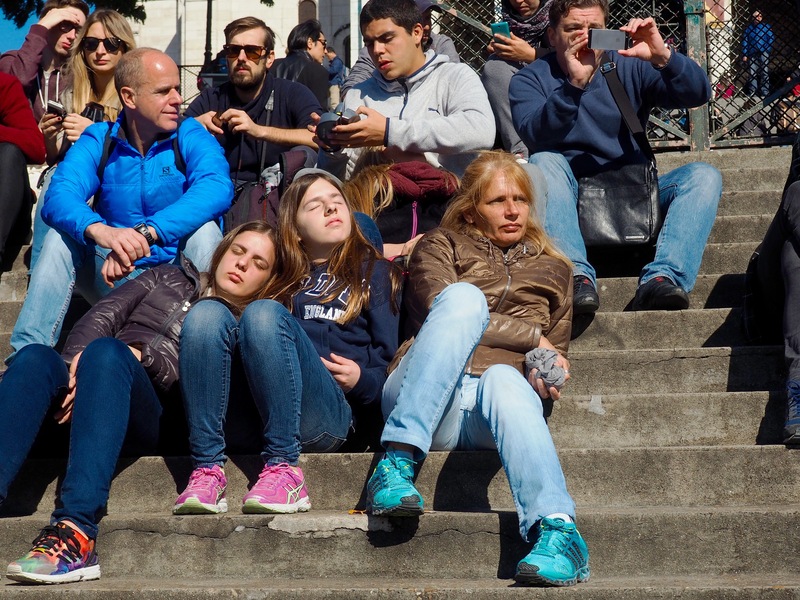 Tourists enjoying the music on the steps. Something you need to know about me is that I have a slight fascination with the macabre (I blame my mother and marathons of Law & Order at an impressionable age). 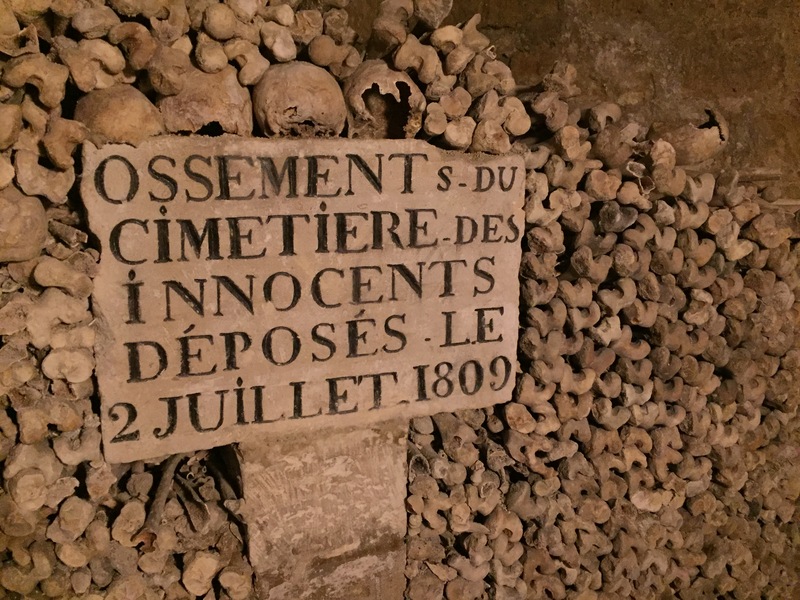 That said, I was pretty excited to explore Paris’ underground cemetery. When we arrived at the entrance, we were disheartened to see a line stretching nearly around the entire block! Normally I wouldn’t have even considered what promised to be an excessively long wait, but it was Sunday, and everything was closed anyway, so what the hell? 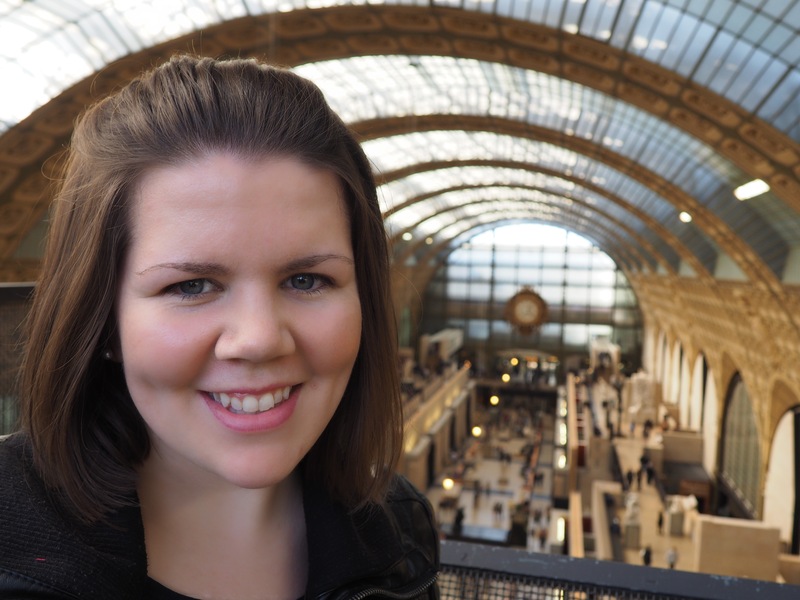 Plus, our friend Caro was with us (in Paris for a few days on her own European adventure) and we took advantage of the long wait to catch up and compare notes on our Air BnB experiences. The two hours didn’t exactly fly by, but it was worth it as we descended deeper and deeper into the tombs, bones piled high on either side of us. Given the size of the line we’d waited in, we were half expecting to shuffle through the passage like a herd of cattle, but we actually found ourselves on our own for most of the mile long trek. The ascent back up to street level will certainly test your lung capacity, but you’ll be rewarded with a pretty cool gift shop (and a much-needed bathroom). 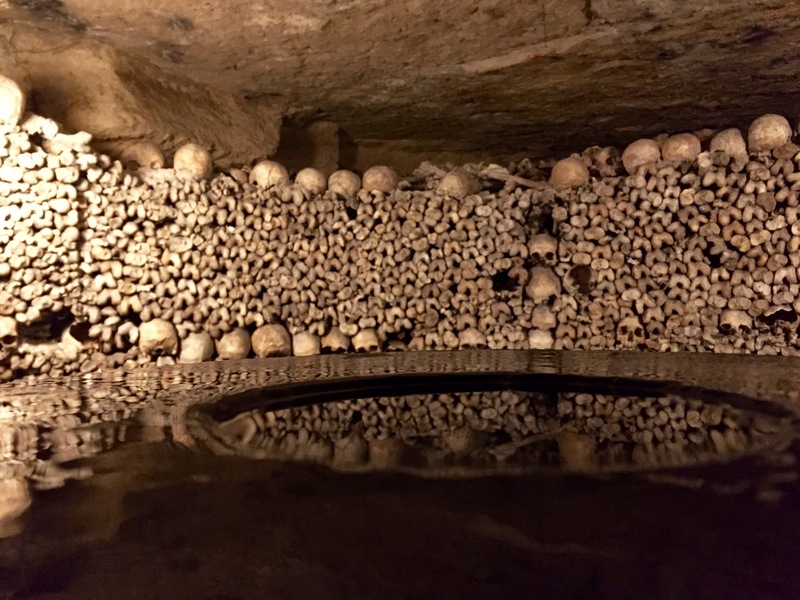 Bones piled high in the catacombs. 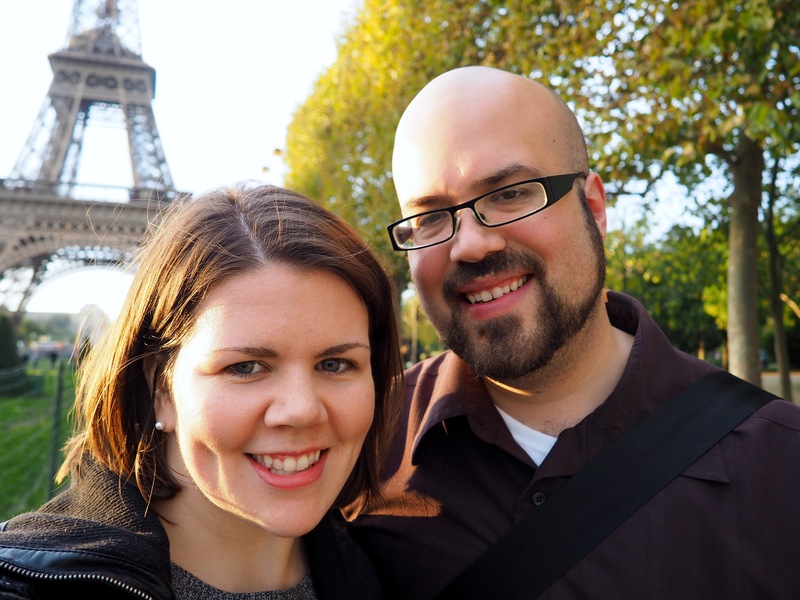 On our last night in Paris, we were making our way to dinner in St. Germain. Eric wasn’t feeling well, and so instead of walking across the river like we normally would have, we decided to take the train. Descending into the tunnels of the Chatelet station, we could hear the faint sound of Puccini somewhere in the distance. The further we walked, the more the music swelled, until we came upon a man standing on a set of stairs in the middle of one of the most amazing renditions of Nessun Dorma I’d ever heard. We’d seen so many incredible street performers during our time in Paris, but this man put them all to shame. We stood there in the crowd that had gathered for three more songs until we reluctantly headed to dinner, but I honestly could have sat there all night listening to him sing. Eric managed to capture some footage on his phone; click here to see! I never knew I really cared that much to see the Eiffel Tower until I was right there. Despite months of planning, it wasn’t really something that I’d considered much. I don’t do well with heights, so ascending to the top of a hundred year old skeleton of a building didn’t really appeal to me. That said, I wasn’t prepared for the first time I caught a glimpse and I nearly lost my breath I was so in awe! 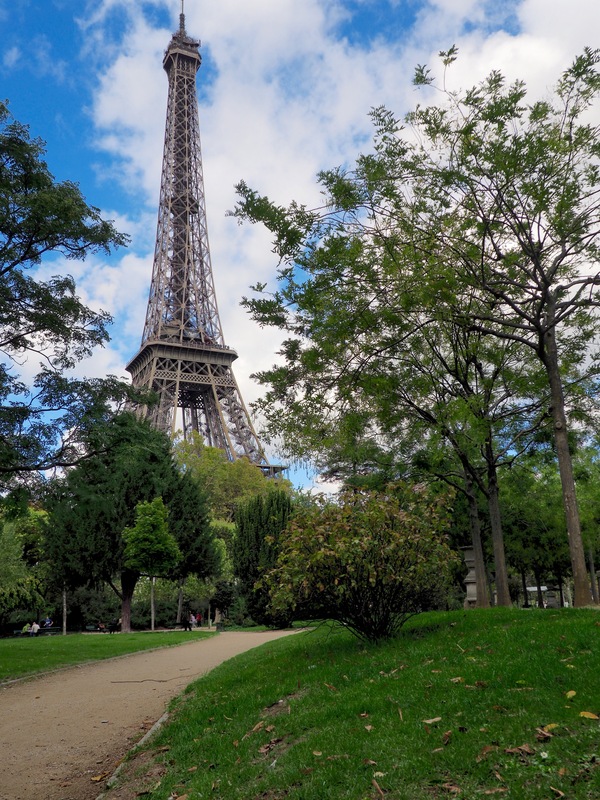 Maybe it was just the excitement of Paris seeping into my bones, but I got more than a little camera happy whenever the tower came into view during our two-week stay. The first time (quite unexpectedly) seeing the Eiffel Tower. 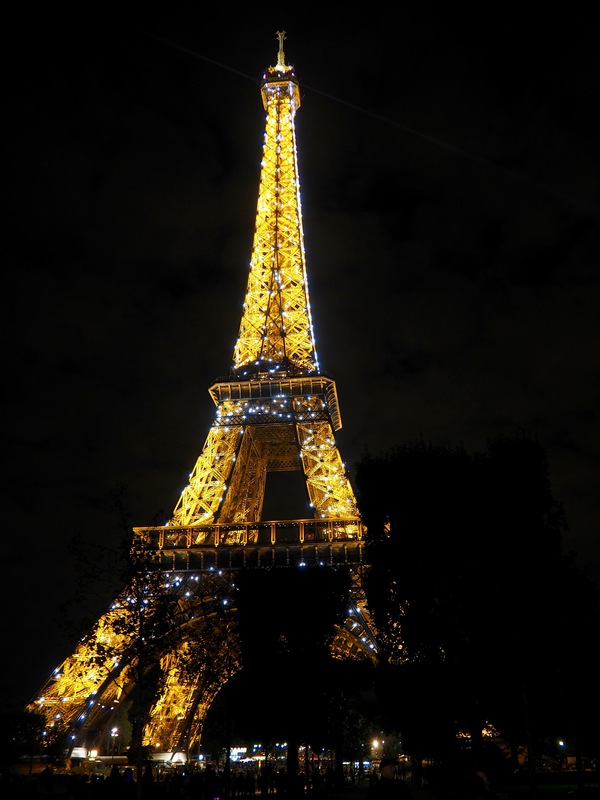 Every top of the hour, for five minutes, the tower comes alive with sparkling lights. While planning our trip to Paris, we were both pretty indignant about seeing the Louvre. The sheer size seemed daunting, and most of what we’d heard was that it was often too crowded to enjoy. 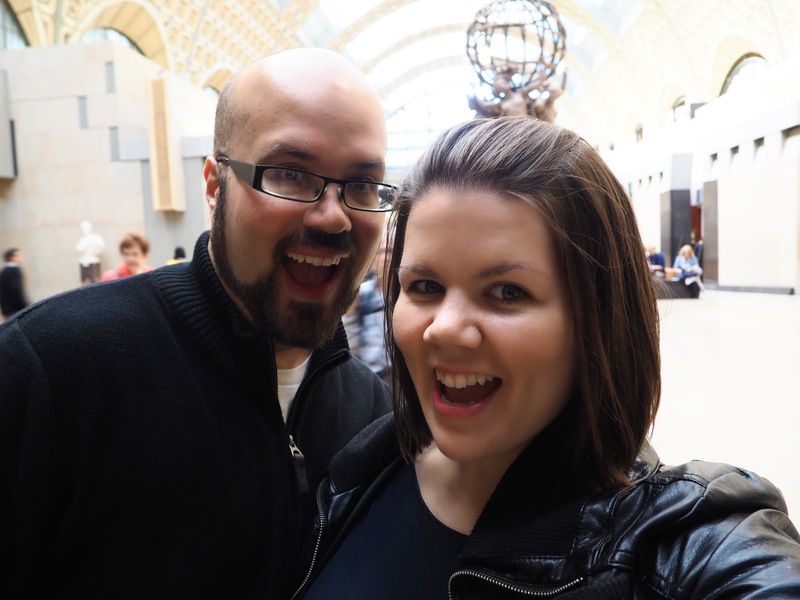 On the other hand, we’re both artists, and there was no way we could come all the way to the art capital of the world without experiencing at least one museum. 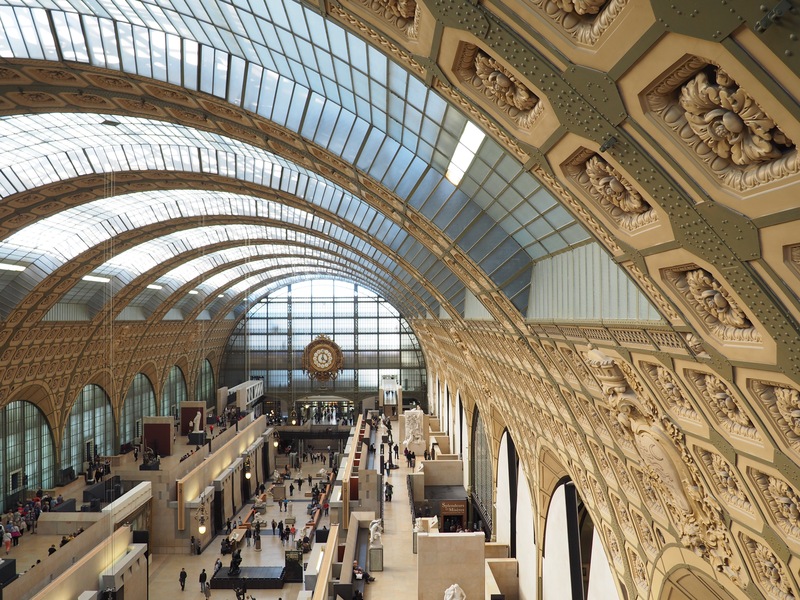 So, thanks to much urging from my sister and several friends, we chose to spend a day at the Musee d’Orsay. From the moment we walked into this old converted train station, we were in awe of not only the collections, but the building itself. My favorite part (as is usually the case) was watching my husband’s face while listening to him nerd out over brush strokes and color palettes. (Note: If you want to get the most out of any museum experience, bring an artist). 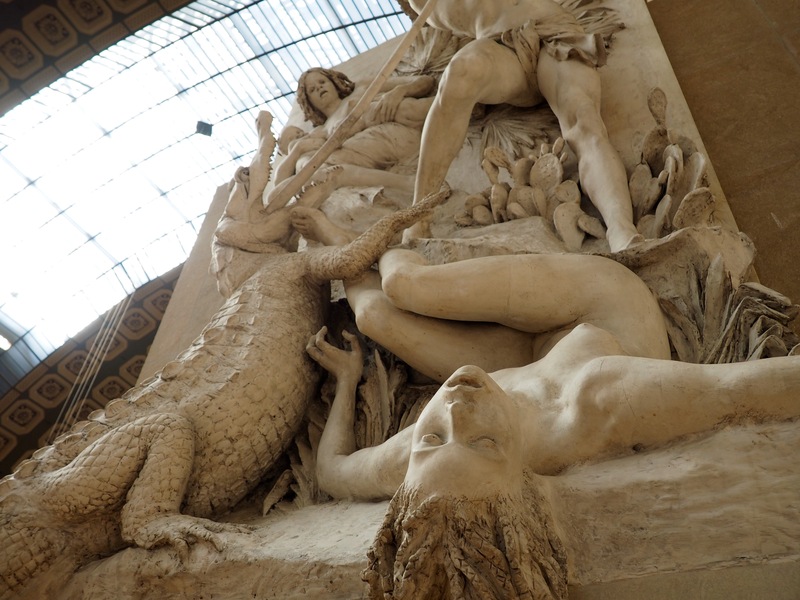 I don’t generally take many photos when I visit museums, because whatever I can capture with my little camera will never do justice to what I’m seeing in front of me. That said, I did photograph the s*** out of the building itself. Overlooking the museum from the fifth floor bridge. From inside an old clock. 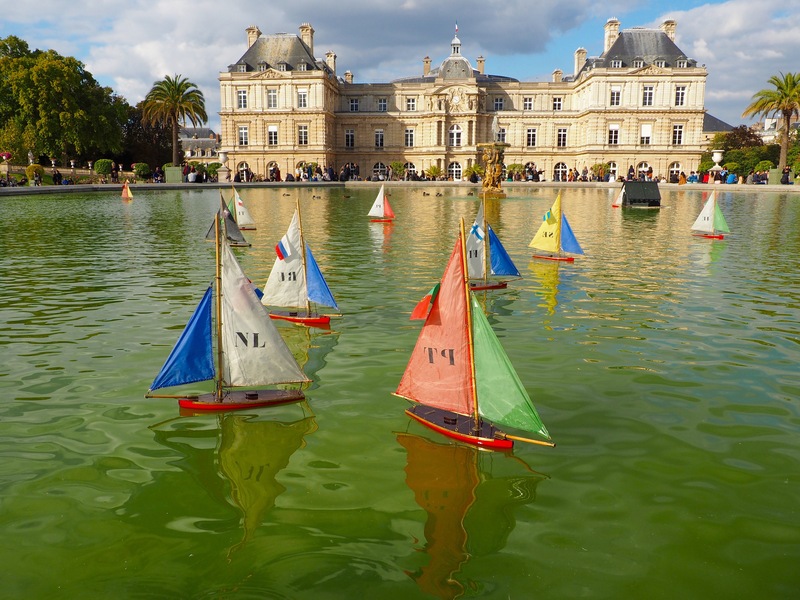 Coming soon: More posts about our trip to Paris, including our favorite food moments, where we stayed, and our day biking around Versailles!